Click on the links, or on the pictures along the right side of the page in order to see the full-sized, complete photos. I went through P&P2 looking for the different dresses which Lizzy wore, trying to answer the question: which one does she wear the most? The answer is that there are two which she wears nine times, both are florals. One has large pinkish flowers, the other has a gold waist band (this one may just be a print, I can't really make out the pattern). I didn't keep track of the screen time for each gown. 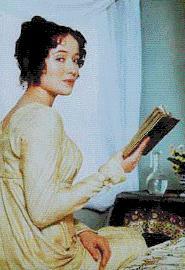 Certainly her linen-coloured dress is present in the most important scenes, both of Darcy's proposals, for example. There is some uncertainty in my tally. For example, when she wore the same dress two scenes in a row, I would usually count it only once, but at other times, when there could have been (or should have been) time passing in between the two scenes, I counted it twice. 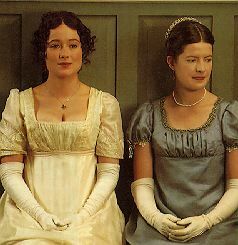 On one occasion that goes the other way, there is a separation of scenes, when there should not be--all the scenes before Lydia's wedding should take place on the same day, with Jane and Lizzy talking that night. There are two dresses which seem to be polka-dot (I can't really tell on my tape, they may just be a small print) which are hard to tell apart. One has a slightly lighter background with no trim on top but dark trim on the bottom hem, the other has a slightly darker background with dark trim on top including buttons on the front and no trim on the bottom but with dark wrist ties (no picture). 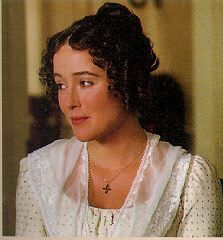 Lizzy is wearing the same gown, a gauzy white-on-white stripe, when she first sees Darcy (opening riding scene) and when she first sees the new Darcy at Pemberley. In between these two scenes this dress is not worn at all. 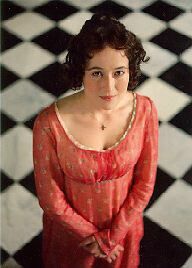 She wears the same gown for both of Darcy's proposals. The polka-dot dresses tend to be worn in the winter, the florals in the spring and autumn and the stripe and criss-cross in the summer. She seems to get a new dress in the summer, the white-on-white criss-cross is first seen when Lydia goes off to Brighton. After that she wears it a lot. Walk to Netherfield--six inches deep in mud. Meryton Assembly ball. This one is a bit unusual, because it appears in two different forms. 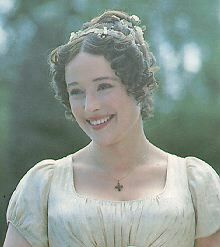 It has short sleeves in the Meryton Ball scenes, and forearm length in all other scenes. It looks like they folded the sleeves up for the ball. 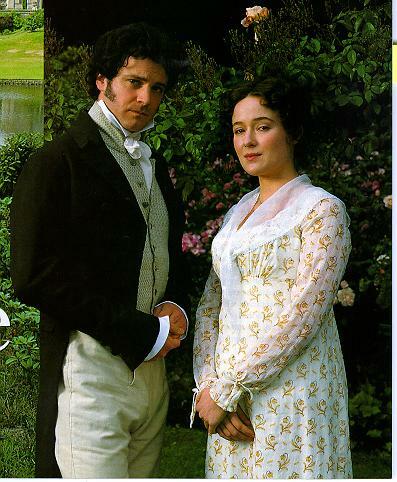 This dress is also the one that prompts "The Look" at Pemberley. 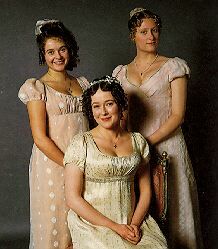 Additional Note: This dress also seems to appear briefly in the opening credits. The pineapple design on the sleeves can clearly be seen as Andrew Davies' name is shown. Gathering flowers with Jane after Meryton ball. 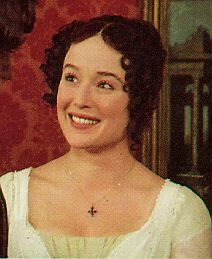 Mrs. Bennet's visit to Netherfield. The first of these pictures is a bit unusual, and appears to me to be strictly a publicity shot. 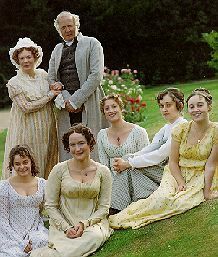 My reason for this supposition is that Darcy is wearing a cape, that he never wore in the production, and which looks every bit like the capes the officers were wearing. Straw with blue ribbon, Tan all-fabric, Straw with brown fabric in back, Big floppy rust bonnet, Flat rust bonnet (only worn in Kent), Wedding bonnet. Light-blue jacket (spencer), Brown patterned jacket (spencer), Rust jacket (spencer), Black jacket (spencer), Netherfield Ball coat, Long blue coat, Dark-grey jacket (spencer), Wedding coat. One with a collar, One scoop-necked which is always worn with a filmy robe over the top. Long red plaid, Long white, Very short white, Maybe two lace scarves, Bedroom scarf/shawl (cashmire? ).